Fragrant white flowers appear on the Seven-Son Flower from late summer to early fall. Though not much in the way of fall color, as the leaves drop beautiful peeling bark is revealed. The gray brown exfoliating bark retains interest to the tree throughout winter into early spring when once again the long vein defined dark green leaves appear. 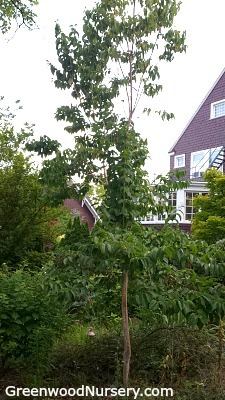 A member of the honeysuckle family, the Seven Son Heptacodium is a fast growing tall shrub maturing in the 15 to 20 foot height range with a spread of up to 15 feet wide. Good source of nectar for butterflies for late summer to fall. Use in windbreaks, hedges, street tree, and to screen out areas. Water the Seven-Son Flower Heptacodium miconioides regularly for the first year for the plant to establish its deep root system and during extreme heat afterwards. Fertilize with a neutral time release formular in spring after the leaves emerge. Flower buds form in spring so pruning should be done in late fall to late winter or early spring. Some may experience sprouts from the base - clip away unwanted sprouts. Plant can be grown as a single or multi-shrub plant. Seven-Son Flower Heptacodium miconioides is available in 4 inch containers. Orders shipping to AZ and CA will be bare rooted before being prepped for shipping. I bought 2 of these plants several years ago and found they were incredibly invasive with shoots coming up everywhere in my garden. 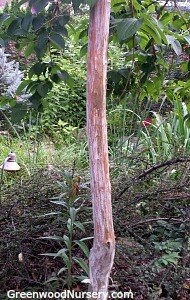 Finally, I cut them down and applied a stump killer, but even now there are new shoots appearing. Mine didn't look the the tree in your picture but were multi branched shrubs that I bought from a very reputable nursery with no indication of this kind of a problem. While we haven't found the Seven-Son plants to be invasive, they can produce sprouts at the base like red twig dogwood or some crape myrtles often do. If this happens, clip away the sprouts that you do not.